Humanity learned a hard lesson last week: Handing out free cheesecake, while it sounds like an infusion of pure goodness, is too much for the world to handle. Let's aim for something less idealistic then; a free bagel is more doable, more practical. One step at a time, and we'll get there someday. So we feel safe to report that Panera Bread is giving out free bagels every day until the end of the year. To get one (actually, a lot more than one), all you have to do is sign up for MyPanera Rewards, and Panera will hand you the breakfast stable each morning until the new year comes -- at which point you might resolve to never eat a bagel again, or possibly switch to an all bagel diet. That's between you and your conscience. There's some fine print though. First, this deal is only available in-café, so you're not getting a bagel personally delivered to your residence. Second, the offer apparently "excludes cream cheese and other spreads"; as we've already established, the world isn't perfect. Third, this is only available to new members. So if you've already been collecting rewards, you won't be getting free breakfast. We're sorry. It's not up to us. 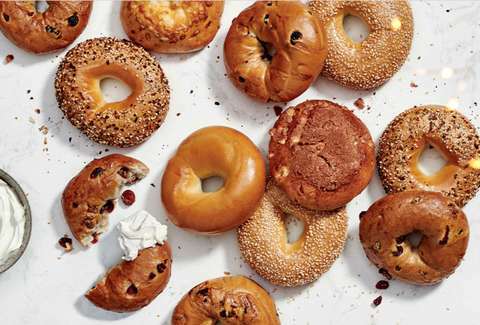 We think you deserve a free bagel, and you're probably a wonderful friend. On the bright side, though, there aren't any charges for being a member of the rewards program, and there's no purchase necessary -- so you have no choice but to eat an unconscionable number of bagels.